Gravid male dwarf sea horse. The male has a pouch where the female deposits her eggs. It is the male sea horse that incubates her eggs. Ed: One of the worlds most intriguing and mystifying life forms are from the Syngnqnathidea family. These are the sea horses. When people first see them, they are fascinated . It has been reported by some salt water aquarists that sea horses are difficult to impossible to keep. All that is necessary is the desire to understand what these magnificent creatures require to thrive in captivity. And the discipline essential to secure breeding pairs, allow them to reproduce and take care of the fry. Chris Noonan has been keeping aquariums since he was 10. Chris will be 19 in September of 2001. This talented young man offers information he has gleaned. This includes step by step information as to the necessary equipment and technique he employs to not only enjoy these exotic pets, but to breed them and raise fry. One of the most enchanting of all marine animals is the sea horse. 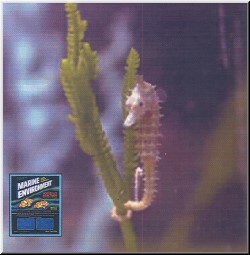 The sea horse is very easy to care for, as long as you can tend to their food and water requirements. I hatch baby brine shrimp as a primary source of food. I use Marine Environment(r) dual phase formulaTM. The dwarf sea horse reaches a maximum size of 2 inches. They should be kept in peaceful aquariums 20 gallons or smaller. 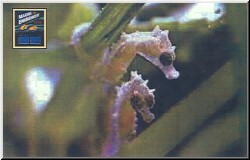 Dwarf sea horse is fry size 1/8″. It is possible to keep as many as 2 dozen in a 2 gallon, 75 dwarfs in a 10 gallon, and up to 200 in a 20 gallon! This would be the absolute maximum. Tanks with this much bio-mass must employ efficient filter systems. Large amounts of beneficial algae should be cultivated. Algae feeds on fish waste and increases essential dissolved oxygen. 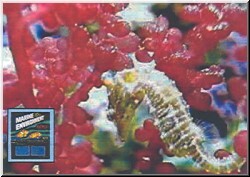 The experienced sea horse keeper can keep large numbers with the proper knowledge and equipment. As dwarf sea horses grow the population in each aquarium should be reduced by moving some to other small established aquariums. Filtration: Proper biological filtration is essential. I have a 30 gallon aquarium which is currently housing 22 dwarf sea horses. It is filtered by a biowheel. When I got the dwarfs, I had the filter on. One dwarf sea horse was swimming by the intake of the filter, It suddenly got his tail sucked into the intake of he filter! Now, I have a sponge over the intake and the babies don’t even get sucked up. Any replacement sponge from a sponge filter will do. Hitching Post: The most essential items to provide are hitching post type decorations inside the aquarium. A hitching post is a sea horse tree, plastic plant, live plant, manzanita branch or even a coral branch that the sea horse could grab it’s tail onto. They do this in the wild so ocean currents will not toss them around. Even if there is little to no water movement in your aquarium, the sea horse will instinctively attach itself to a hitching post. They do this to relax, take a break from swimming and have a secure place in which to lean out and snag a piece of food that might be moving by. The hitching post is essential. One of the best things about the dwarf sea horse is the the ability of their fry to accept baby brine shrimp as a first food. 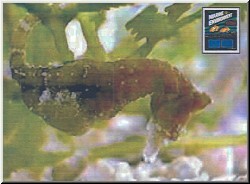 The regular sea horse H. combs (although larger when adult) produce fry that are too small to eat baby brine. The larger sea horse fry must be fed rotifers or other tiny foods. Feeding: Feeding the dwarf sea horse is the reason they are so easy to keep and breed. Dwarf sea horses and their fry eat baby brine shrimp. To hatch brine shrimp, you need: brine shrimp eggs, an heated aquarium (freshwater or salt water), one clean two liter soda bottle that has the bottom half cut off, an air pump, air line hose, closes-pins, and a flashlight. If you already have a marine aquarium, just fill the soda bottle with water from that tank. Close-pin the cut soda bottle to the inside of a tank that is heated. The tank can be either fresh or salt water. We are using this tank to heat the salt water and brine shrimp eggs we will put in the bottle. Put one end of the air line tubing so it discharges at the bottom of the bottle. Connect the other end to the air pump and plug it in. Add salt water and brine shrimp eggs to the bottle. In about 18-24 hours, the bottle will have baby brine shrimp. Shut the pump off and allow the water to settle. In 10 minutes shine the beam from a flashlight to the bottom of the bottle where the air-line hose is. Take the end that was connected to the air pump and siphon the brine shrimp out into a separate jar. When you are ready, shut off the filter in your sea horse tank and slowly add baby brine into the horse tank. Keep the filter off for about 1 hour so the baby brine will not be to into the filter. If you are planning to be away for a weekend, just sprinkle some brine shrimp eggs in the sea horse tank so they could eat for most of the day. If you are planning doing this for a while and you will be away, you should get a timer for the filter so the filter shuts off around 11 AM. Then have it turn back on at 4 PM. The sea horses should have small amounts of food in the tank for most of the day. It is not good to dump a days worth of food into the tank all at one time. Add small amounts during the day.Be careful not to allow uneaten food or excessive waste accumulate in the tank or caught in the filter. Next issue will have part 2 of this article.